There are many ways to rational use of water resources in everyday life. However, not every consumer knows what are modern devices that allow both to save water and significantly reduce the cost of utility bills. The purpose of this article is to provide objective and most comprehensive information regarding the most efficient water saving devices and the principles of their work. What types of mixers allow you to save more water? A significant cost item in payments for utility services in many houses and apartments are sinks and sinks installed in kitchens. use of which is supposed to mix hot and cold water. In the case of outdated two-valve mixers, it is often impossible to quickly achieve the required flow temperature, with the result that a large amount of consumed resource is wasted. This problem can be solved by modern water-saving mixers, which have not only constructive, but also functional differences. When using this sanitary equipment, the process of setting the temperature of the water flow, as well as the intensity of pressure, takes much less time compared to two-valve devices. 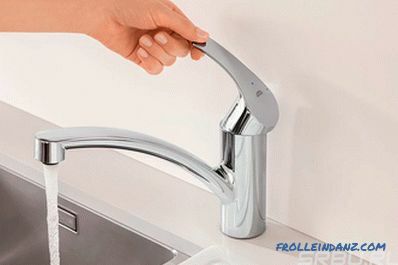 Due to the design features, the mixing of hot and cold water is regulated by means of a single lever. It also has the function of flow control. In this case, both processes can be performed simultaneously. To stop the water supply, simply lower the lever. At the same time, the temperature setting will be saved. This is quite convenient from the point of view of periodic overlapping of the flow during the water treatment, because the next time you turn on, you will not have to re-perform the adjustment manipulations. With the help of thermostatic mixers, a predetermined water temperature can be maintained for a long period. This is especially true in homes where water pipes are far from perfect, and frequent pressure drops in risers lead to quite noticeable discomfort during water consumption. When using a thermostat, which is entrusted with the function of automatic adjustment, there is no need to constantly engage in manual adjustment. In the conditions of an unstable water supply system, this can significantly reduce the amount of water consumed. In addition, thermostatic devices make it possible to conserve water in the shower process, since the user can minimize the flow rate at any time. In most modern thermostats, there are special eco-buttons, which are located directly on the case. 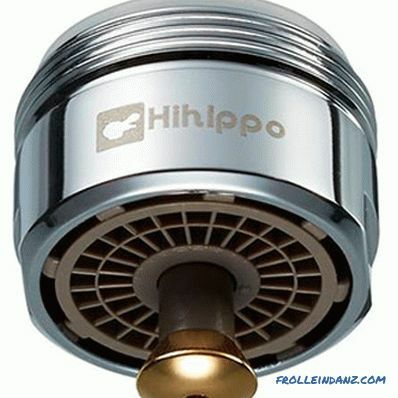 To reduce the pressure it is enough to press such a button, instantly reducing, thus, the water consumption. After pressing again, the normal mode is activated. Often, even when using single-pin devices or reasons, there is an overrun of consumed resource. In manual control, one way or another, the human factor is laid. In order to completely eliminate wasted water consumption, modern manufacturers offer contactless models of mixers that are equipped with infrared sensors. During the operation of such equipment there is no need to touch it. It is enough that the user's palms are in the range of the sensors. Water will flow smoothly until the hands are at the bottom of the spout. 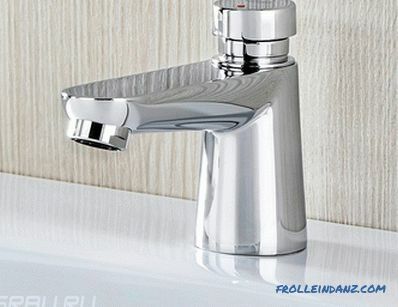 Such devices are considered to be the most hygienic, since in the process of carrying out water procedures there is no direct physical contact of a person with the surface of sanitary equipment. From the point of view of economy, they are not only ideal for the home, but also are capable of significantly reducing the consumption of resources when used in public places. With certain needs today, you can choose a combined model. Such mixers are simultaneously equipped with a programmable IR sensor and a conventional lever, which allows manual adjustment of temperature and pressure. Since these devices operate with built-in electronics, care must be taken to ensure uninterrupted power supply. 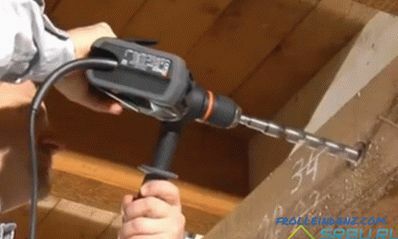 The operation of the equipment can be carried out both by connecting to the mains and using autonomous sources. With timely replacement of batteries, the mixer can be used at times when there is no light in the house. In these devices, as in electronic models, limited water supply cycle.However, unlike contactless products, pressure mixers are designed for manual control. The stream is turned on by pressing the button, and the shutdown occurs automatically after the set time has elapsed. 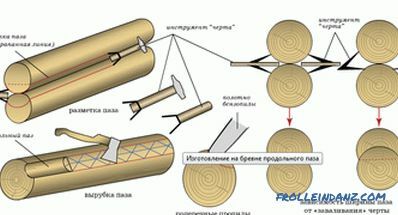 If necessary, the operation can be repeated several times. With this technology, water consumption will be minimized regardless of the human factor. Today, the range of the proposed models of pressure type is quite extensive, which makes it easy to choose the right equipment for a washbasin, bath or shower. In addition, there are often commercially available thermostatic mixers of this type. 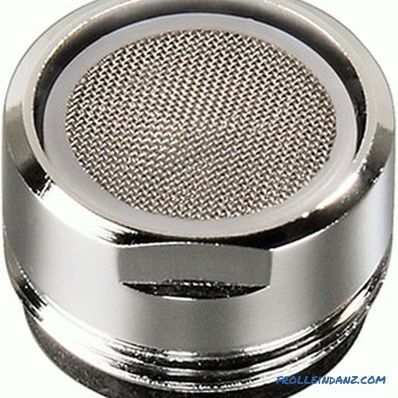 The aerator is a water flow restrictor in the form of tip spout nozzles. At the exit, the jet is saturated with air, due to which it becomes more voluminous. Thus, the flow restriction is almost imperceptible, while the saving of consumed water resource reaches 10-15%. In addition, the jet that contains air bubbles is quite soft and more pleasant to touch. The integrated membrane distributes the pressure absolutely evenly. When using the aerator, as a rule, there are no hydraulic shocks, and the splashes do not fly around. With this device you can also adjust the direction of the jet. Aerator with start / stop function. Aerator with change of direction of the stream. With regard to shower equipment, the issue of reducing the amount of water consumed is particularly acute. For a full wash, a strong enough pressure is always needed, which, in turn, inevitably leads to overspending. Therefore, in the production of modern watering cans, special attention is paid to water-saving technologies. Common enough today are all kinds of flow limiters. Insert with holes. 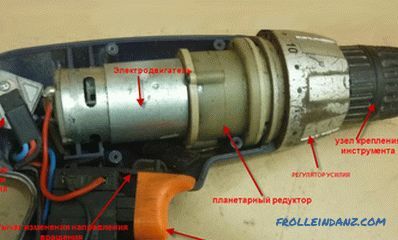 The function of the limiter is often performed by an insert installed directly in front of the watering can, in which there are holes of a certain diameter. Since the capacity of such an insert is significantly lower than that of the shower head itself, the use of such an element reduces the water consumption. Silicone ring built into the watering can. You can limit the limiting flow by using a silicone ring, which is embedded in a watering can. 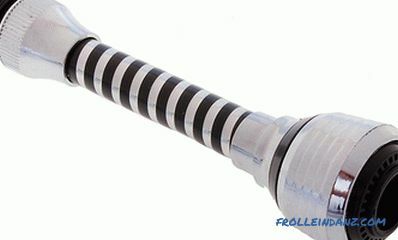 The product has sufficient elasticity and is able to respond to an increase in pressure. At this point, it becomes more flat, resulting in a narrowing hole in the watering can. Thus, by reducing the pressure is spent much less water. Economy mode switch. Flow may be limited temporarily by using a watering can equipped with a special switch, which is located on the body. In this case, there is no need to change the settings of the mixer or to resort to other complex manipulations. 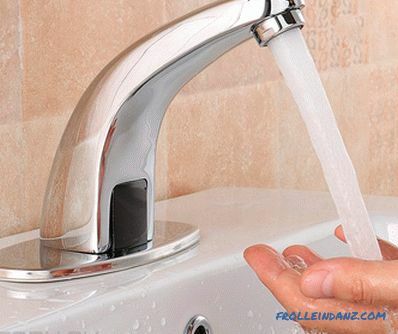 The user at any time can go into the mode of economical water flow through the switch. Previous settings, if necessary, are relatively easy to resume in the same way. 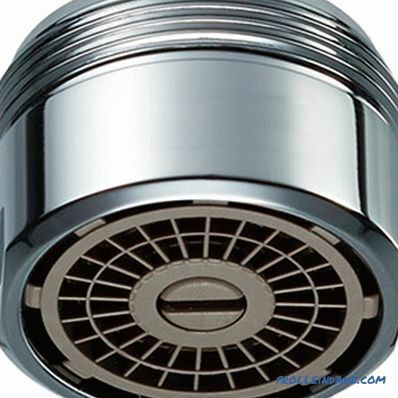 Aerators for shower heads. 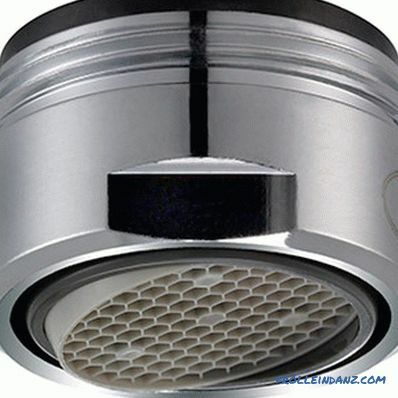 In shower heads, as well as in mixers, aerators can be installed, due to which air bubbles are formed in the water. Air significantly increases the jet in volume, thereby reducing the consumption of resource consumption. 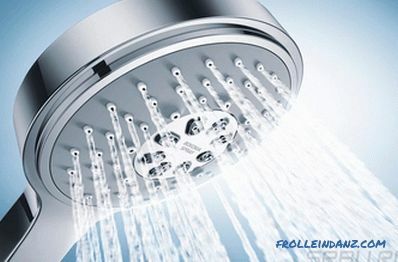 Using the aeration technology, the shower not only becomes economical, but also causes pleasant tactile sensations. Ecostrate. Often in modern models of shower watering cans, the ecostream method is used. In this case, the equipment is equipped with a water-saving mechanism, which is controlled by a rotary ring. When selecting the "Eco" mode, half of the water outlets are completely blocked, with the result that the flow volume is reduced by exactly 50%. The principle of operation of any toilet bowl implies a one-time use of a large volume of water. In the characteristics of most modern models laid the value - 6 liters. That is how much water is needed for proper cleaning. And this is only within one flush, and during the day the toilet bowl is used far more than once. Manufacturers of this sanitary equipment pay special attention to the issue of effectively reducing the volume of drained water. One of the first technological developments in this area is dual-mode flush mechanisms.The principle of their work is quite simple: the discharge can be carried out both with the full and partial emptying of the tank. The presence of two buttons on the lid allows the user to independently determine the amount needed to clean the bowl of water. These technologies, including those used in the production of toilet bowls. For the tanks built into the installation system, both push and touch buttons can be used. There are also models with one long button, which, depending on the choice of mode, can be pressed from one side or the other. In addition, installations that are quite popular today are those that can be used to independently regulate water consumption. 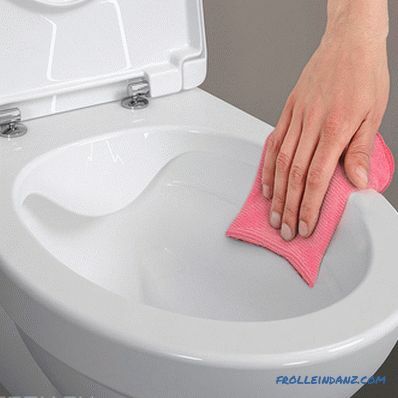 The “flush-stop” function allows you to stop the flow when you press a single button again. 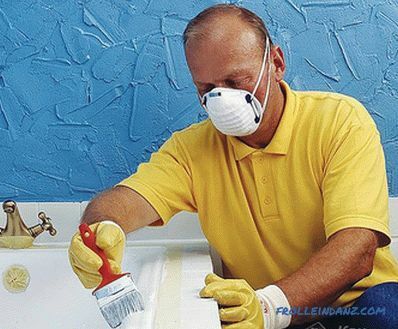 A gradually contaminated toilet bowl needs constant cleaning of all its sections. A certain amount of water coming from the tank goes to that. However, even such minor expenses can be reduced if desired. The hygienic characteristics of this sanitary equipment depend not only on the design of the product itself, but also on the quality of the bowl coating. Traditionally, any toilet bowl should be covered with icing, due to which the surface becomes more dense and prevents the absorption of dirt. However, at present, some manufacturers offer products coated with special dirt-repellent materials that have been developed using special technologies. Since such models are much less prone to contamination, water for their purification requires much less. The main and only structural difference between rimless models is the absence of an inner edge in the bowl. 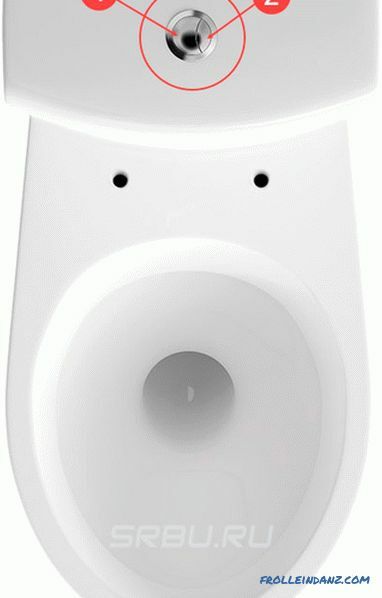 In classic toilet bowls, it performs the function of a guiding element for the water flow during the flushing process. It is the presence of the rim that makes some areas difficult to access and requires a certain amount of water consumed. 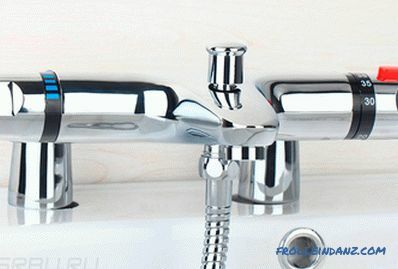 In this case, the flushing system is equipped with a special divider, through which the liquid coming from the tank is distributed in three directions. At the same time, much less water is required to clean the surface of the bowl over the entire area than in cases with classical structures. In the process of changing from manual washing kitchenware to automatic, many dishwasher owners have learned how to save water, practically making no effort for this. 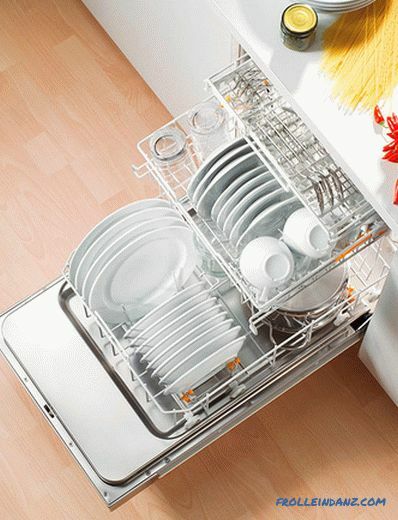 Modern installations are able to wash 12 sets of dishes at one time, using no more than 10 liters. For comparison: the manual method, in which it is necessary to use running water, assumes an average consumption of 12 liters per minute. Despite the fact that the full cycle of automatic washing lasts a long time, the amount of consumed water resource is reduced at least 10 times. That is, this home appliances can rightly be considered one of the most economical.